Kent: Kent State University Press, 2004. 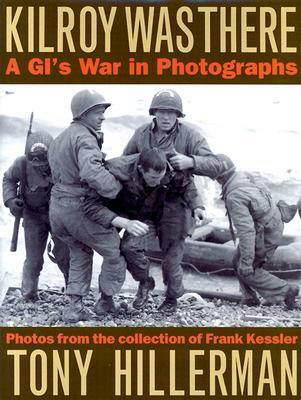 This is a photo-book containing images of World War II, which were taken by Frank Kessler during his time in the Army Signal Corp. Tony Hillerman gives narration to the sometimes bloody photographs in Kilroy Was There: A GI's War in Photographs. The title refers to an American popular culture expression, "Kilroy was here", which became associated with American GI's during WWII. It is typically seen in graffiti and is often accompanied by a bald figure with a long nose peeking over a wall. The book was published in 2004 by Kent University Press in Kent, Ohio. Format: Hardback, 28.5 x 22cm. Binding: Tan boards and cloth spine with the title, authors, and publisher's logo.